All Camp Wightman’s Summer 2018 Youth Camp sessions include a full range of camptivities (we have more than 50 in eight categories) as well as our faith formation, social, and special events programs, so no matter the session theme (like Campolodeon or Summer’s Last Blast) campers will have a well-rounded experience with lots of choice, new friends, wacky “only-at-camp” events, and the opportunity to grow in their relationship with God and Jesus Christ. Wondering what parents have to say? Want to hear about us from a #CWcamperforlife or from a previous first timer? Check out Here's What Our Families Say. Please check the ﻿Youth Camp Availability Chart﻿ for any programs marked with a "YCAC"at the end of their blurb. This will help you know what spaces are available without having to call the camp office. Please remember that in order to be placed on a Wait List for any SOLD OUT program, a camper must be registered for Summer 2018. Directions are available in our Online Registration information on the Registration page. ​Discover activities like deciphering spy codes, DIY catapult-building, or short court tennis. Maybe you'll build your own campfire, check out the stars, or explore archery, bushwhacking, or fishing? Try your hand at simple batik or paper marbling or building the BEST paper airplanes. Special events include Minute To Win It Palooza, Full Moon Palooza, and a Particularly Persnickety Pirate Palooza. Immerse yourself in D&D, launch into Summer 2018, and experience this awesome beginning to our 63rd Summer! Explore Camp W and Dangerous & Daring during this three-night introductory program. Get a taste of camp life, meet new friends, and jump into the adventure of your summer! Extend-A-Stay: Campers who are enjoying themselves may choose to stay the rest of the week (Parents pay remaining balance at check-out on Friday). Our experience is that most youngsters are having so much fun and adjusting so well they choose to stay, so we suggest packing what they need for an entire session - if you end up picking up on Wednesday, then you have the added bonus of taking home clean clothes :). ​Get s'morganized to celebrate s'more Camp Wightman! Join the crew for s'more faith, s'more fun, and s'more friends! Whip up a batch of homemade marshmallows (they are s'more-tabulous! ), help your team build the tallest marshmallow and toothpick tower, and enjoy a Gourmet S'more Feast around the campfire. Special events include the Marshmallow Olympics, a July 4th BBQ & Carnival, and a Jumanji Safari. ​Are you ready for C.H.A.O.S.? That’s Crazy High-energy Activities Of Summer right here at Camp Wightman! Crazy special events like O.M.C. (Organized Mass Chaos), Minion Mayhem, and Dr. Seuss Day (featuring The Cat in the Hat, the Monarch of Chaos and the Things -- What will they get up to next?). High-energy worship, camptivities, and counselors! Activities? Immerse yourself in the C.H.A.O.S. and Summer 2018! ​"We've got spirit, yes, we do! I'm a Wightman Camper, how 'bout YOU?!" Show your Wightman Spirit by registering for this session right away! Get ready for special events like Monochromatic Monday (show your spirit by repping in one or both of our camp colors, green/white), Twin Tuesday (dress like a friend or two or your whole cabin), Wacky Wednesday (well, you never know what will happen...), Thoroughly Thoughtful Thursday (Random Acts of Kindness will abound throughout camp), and Fantastic Friday to wrap up a fantastic session. Special events will include Wightman Olympics and The Great Wightman Color Challenge 2018! Experience an Oooey-gooey S’mores Campfire, Skittle Skattle Battle, Ice Cream Breakfast (That’s right – Breakfast! We’re serious! ), awesome camptivities, and earning all kinds of beads...we do it all. Experience special events including Christmas in July, Pokemon Master Training, and a Jumanji Safari. Make new friends and hang out with cool counselors. Get here for HUGE fun, HUGE new experiences, and HUGE opportunities to learn about God! 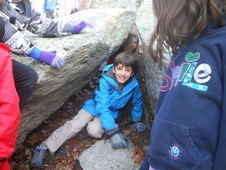 ​Explore Camp W and Campo during this three-night introductory program. Get a taste of camp life, meet new friends, and jump into the adventure of your summer! Extend-A-Stay: Campers who are enjoying themselves may choose to stay the rest of the week (Parents pay remaining balance at check-out on Friday). Our experience is that most youngsters are having so much fun and adjusting so well they choose to stay, so we suggest packing what they need for an entire session -- if you end up picking up on Wednesday, then you have the added bonus of taking home clean clothes :). What’s a “T'weeker?” A camper who spends two weeks (that's right, TWO weeks!) plus an Outrageous T'weekend at Wightman! T'weekers enjoy three times the Outrageous fun packed into an Outrageous two week program! This is summer camp as it is meant to be. Some say the T'weekend is the most amazing part...others just love being here longer and even say that two weeks is not long enough. So, what’s Outrageous? Well, the dictionary says a: exceeding the limits of what is usual; or b: fantastic. AND it's Camp Wightman's fastest growing youth program! In other words, HUGE fun! Each week you will choose favorite activities and write your own schedule plus experience special events like Ice Cream for Breakfast, a birthday party for Harry Potter, a Carnival Palooza with inflatables like the bungee run and slip & slide, Night of the Ninja, or play a round of Jumanji Survivor (you've never experienced anything like this!). How about a late night or two with sleep-ins? Oh, and don't forget the T'weekend complete with incredible Outrageous activities (Extreme Rock, Paper, Scissors anyone?!)! See you there! Please do not attempt this at home, we’re professionals. We’re serious! LEAD is Leadership Evangelism And Discipleship! It is about building up young leaders who will be the change makers of tomorrow. This program is designed for high school students who are maturing in their Christian faith, and want to take it to the next level. This is about Wightman fun - you’ll participate in Outrageous, make new friends, and enjoy being a camper. It’s about developing a servant’s heart -- to learn to lead. It’s about living out your faith - in a way that others can see what you believe and whom you follow. It is about discipleship - choosing to make faith personal and the challenge of following Jesus. First Week includes intensive training sessions, bonding as a team, and good ole’ fashion camp fun. Second Week provides opportunities to try out what you have learned under the guiding hand of experienced Wightman role models. This first step in Camp Wightman’s Teen Leadership Development Program is a selective program. We are looking for campers we believe will benefit most from the program, are of a maturity level that will allow them to think of others before themselves, and are already disciples of Jesus Christ. You will complete an application and references as a part of the registration process, plus fulfill an interview requirement. If you are not chosen for the program, any fees that have been paid on your behalf are fully refundable. We welcome you to apply if you think you have what it takes -- let’s find out together! DEADLINE for registration and application: March 15, 2018. Our last Youth Camp session is loaded with all the incredible stuff that makes camp ROCK! We only have six days to celebrate summer so expect the schedule to be jam-packed, and filled with the best camptivities and special events of Wightman 2018. Get ready to have more than the legal amount of fun and celebrate the end of summer at your home away from home, Camp Wightman! Listen for the echoes of summer camp...laughter, the wind in the trees, running feet, splashing, and the sound of voices: “Come, now is the time to worship...” “Look at the size of that fish!” “Another round of GaGa, let's go!” “Jesus is the Rock and He rolls my blues away, Bop-shoo-bop...” “I don’t wanna go home!” “Camp is too short!” “See you next year!” "Every move I make I make in You, Jesus!" Join the fun at Camp Echo to experience Camp Wightman again. Remember Summer Camp 2018! Get together with old friends, meet new ones, check out Wightman’s Winter Wonderland, sing, drink loads of hot chocolate, enjoy camp activities including the Incredible 2018 Summer Slide Show starring you...In short, get your mittens blown off! Limited enrollment so register early -- this program has SOLD OUT for the past three years!